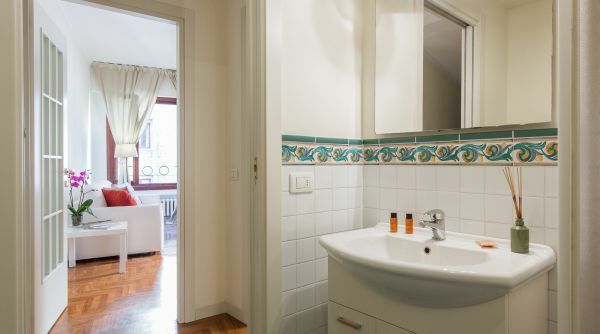 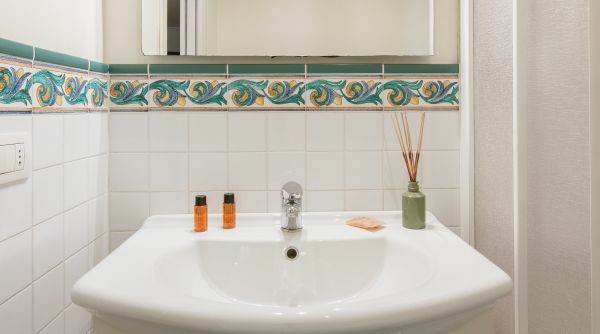 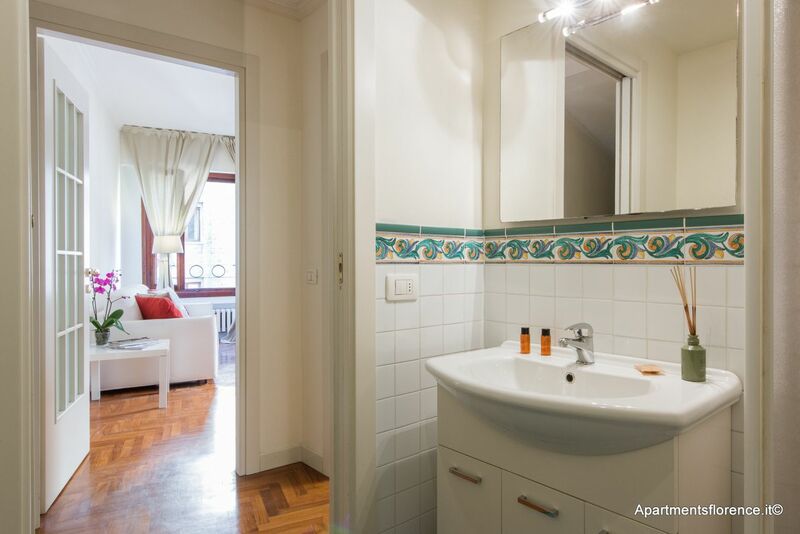 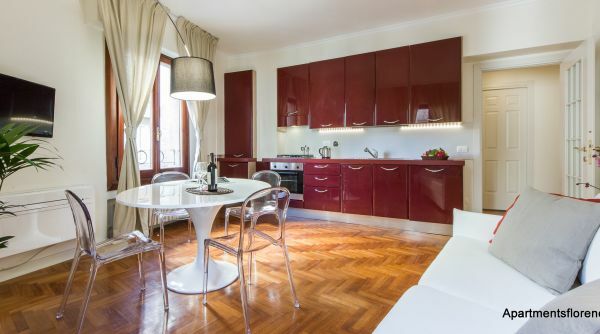 A beautifully renovated 1-bedroom, 1-bathroom apartment in the heart of Florence, right by the Ponte Vecchio. 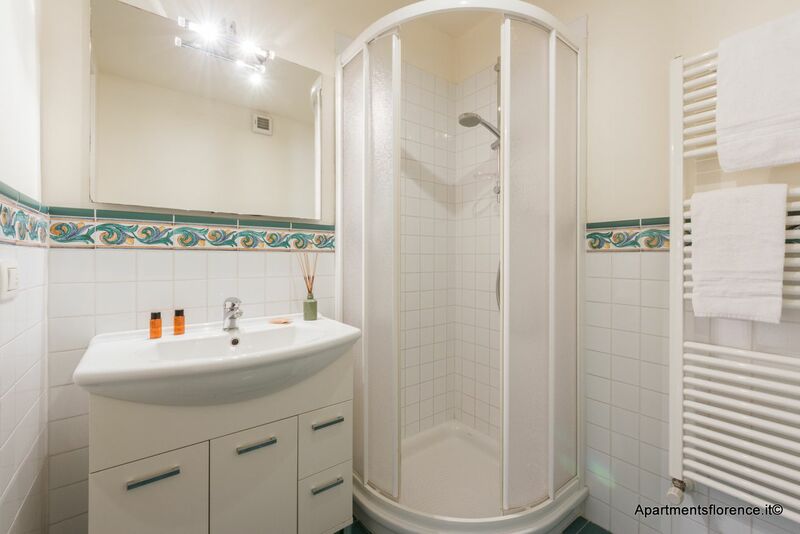 You could not be more central than here! 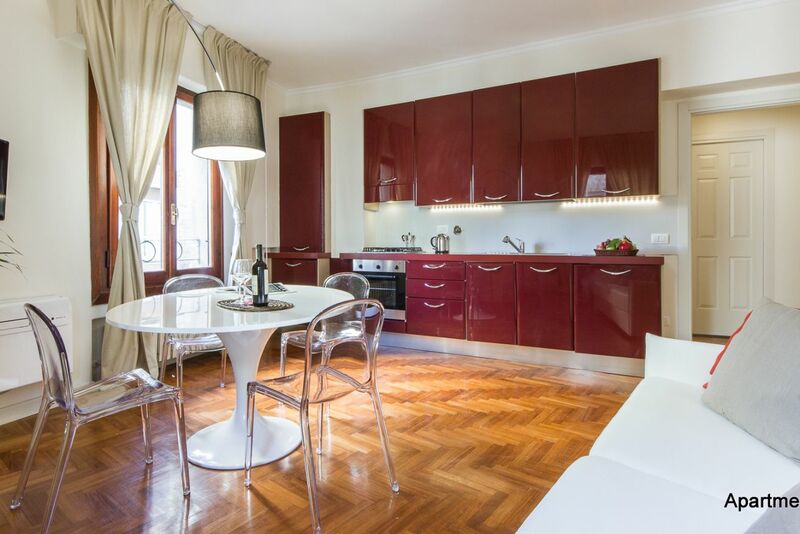 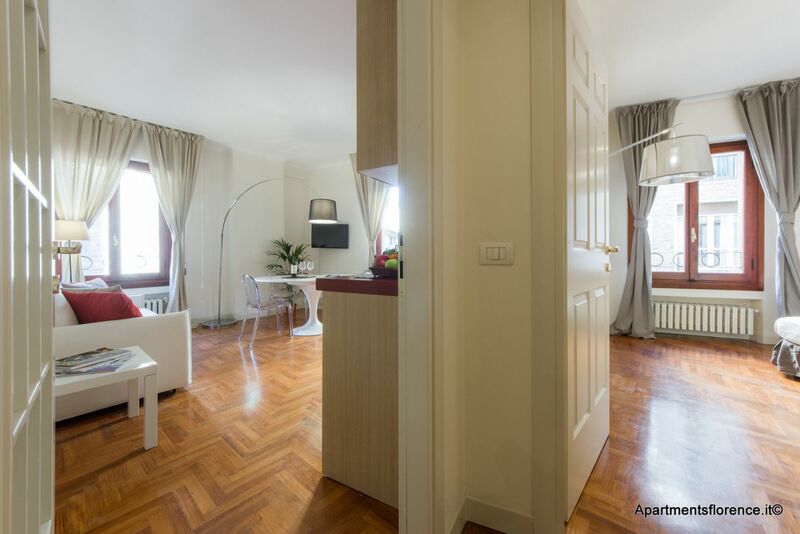 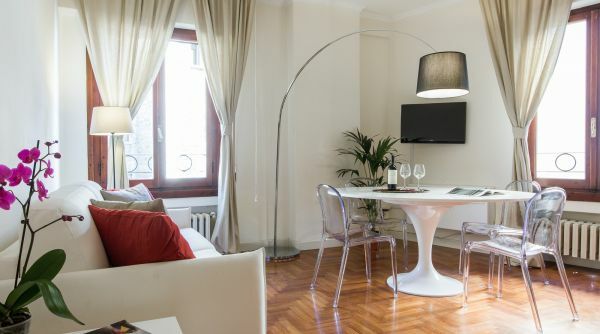 This apartment is located in Via Por Santa Maria, one of the oldest and most central streets in Florence. 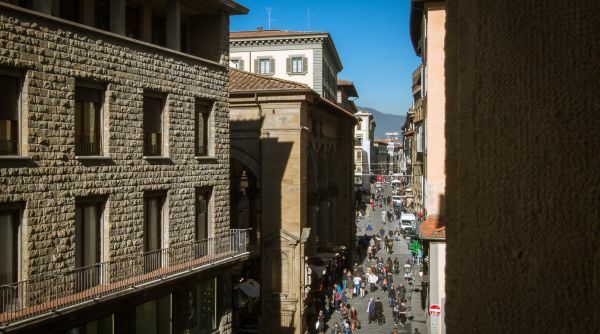 It connects the famous Ponte Vecchio (The Old Bridge) to the centre of the town. 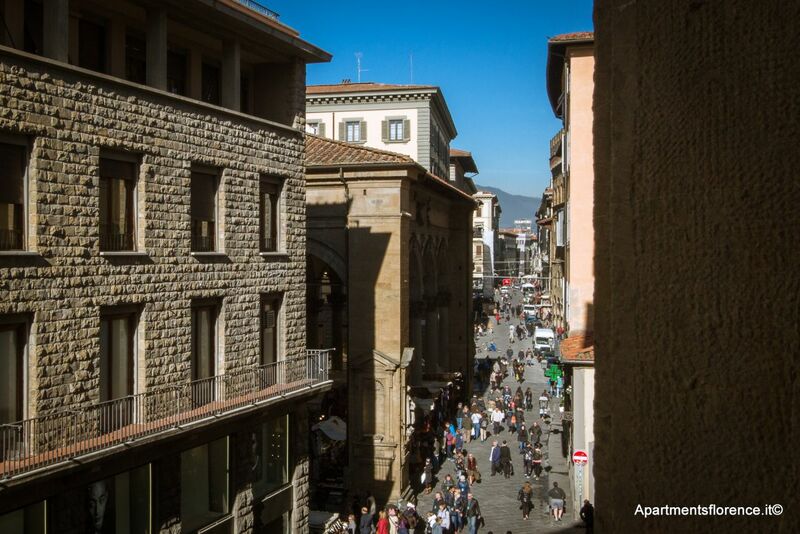 The street of the apartment is always alive full of shops, bars and restaurants. 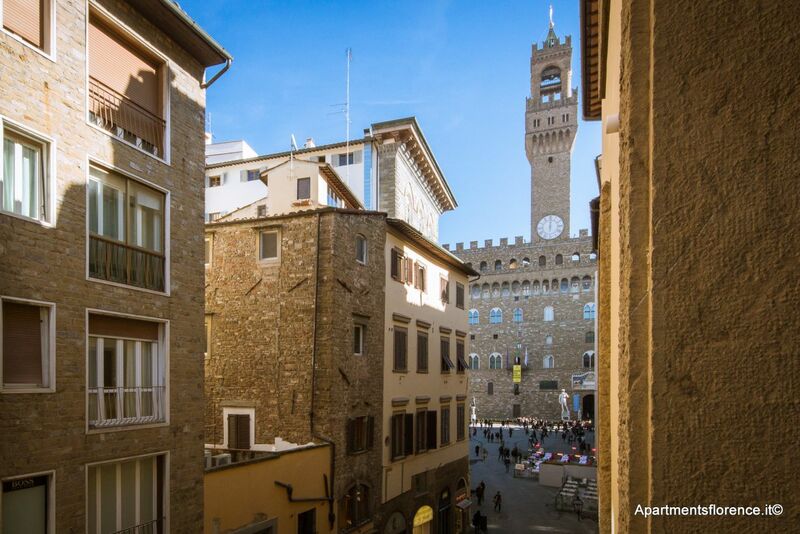 From one of the windows in the living room and from the bedroom window you can enjoy the magnificent view of the Palazzo Vecchio – the town hall of Florence, which overlooks the Piazza della Signoria with its copy of Michelangelo's David statue as well as the gallery of statues in the adjacent Loggia dei Lanzi. 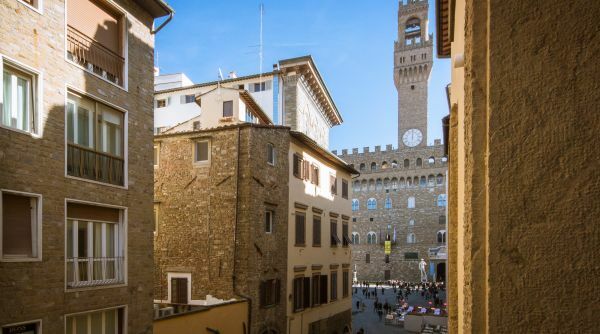 You are also minutes away from all the other famous tourist places in Florence, including the Duomo and Piazza Repubblica. 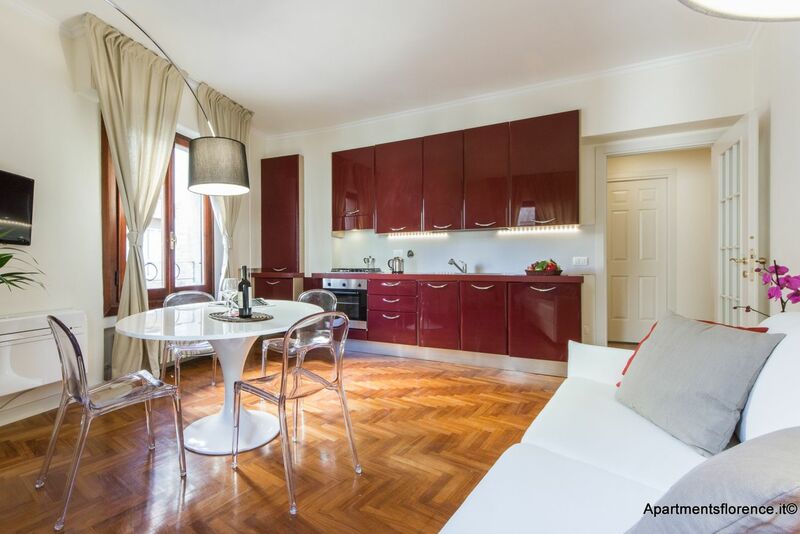 The apartment is on the 3rd floor with an elevator, a rare feature in such central buildings in Florence. 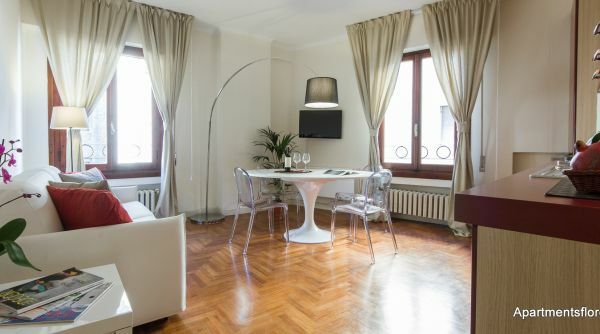 It is recently renovated in an elegant, contemporary style. 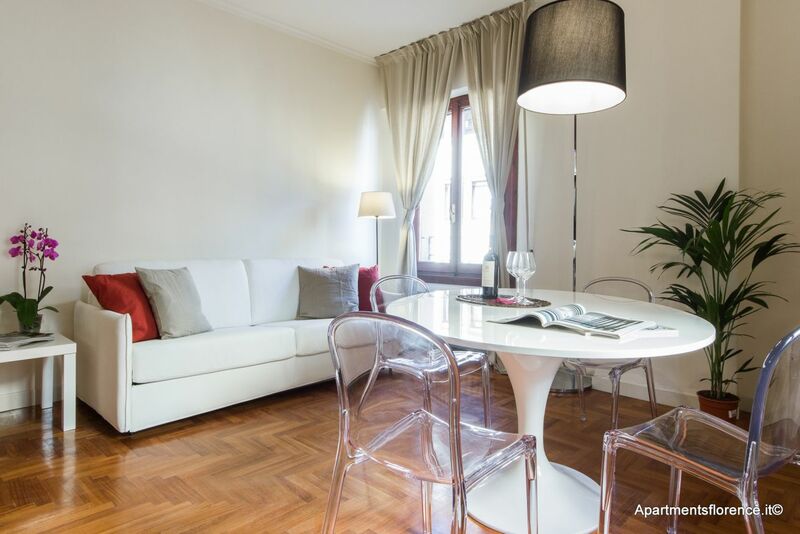 The furniture is modern and the space is used in a smart, practical manner. 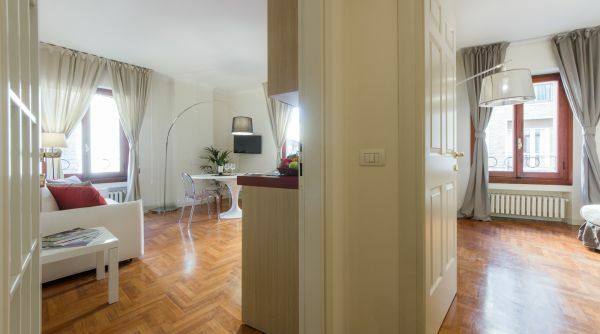 There are parquet floors throughout the apartment that add to its fresh and sophisticated look. 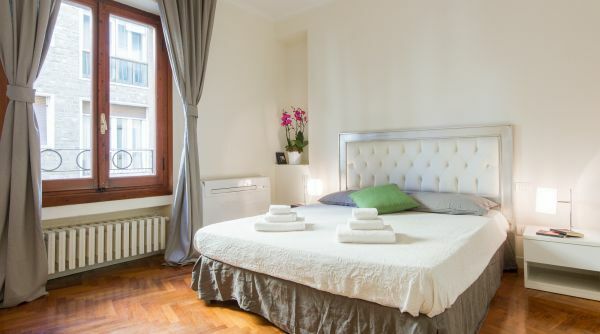 There is air conditioning in all rooms. 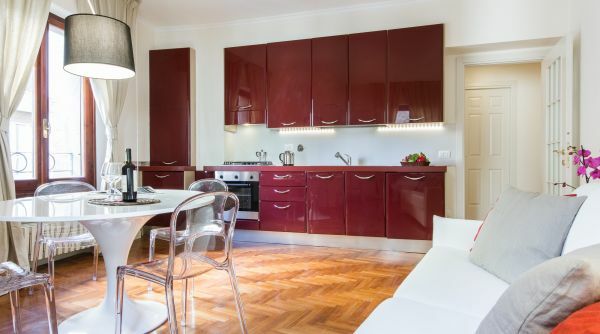 The color scheme is predominantly in the light and natural tones. 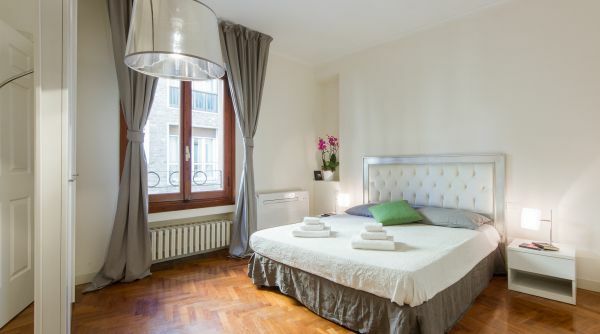 The apartment itself gets lots of natural sunlight during the day, since it has two big windows in the living room and a window in the bedroom facing the street. 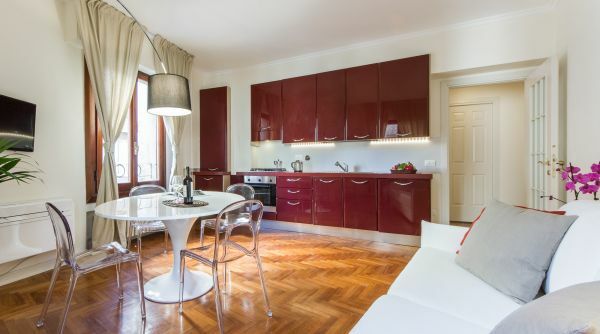 The living room and kitchen are combined creating one ample space. 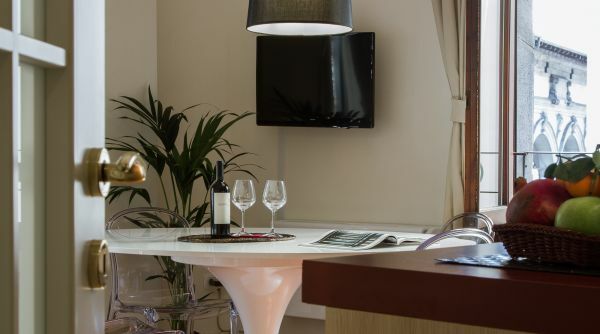 It is equipped with a large sofa bed, a round dining room table for up to 4 people and a flat screen TV. 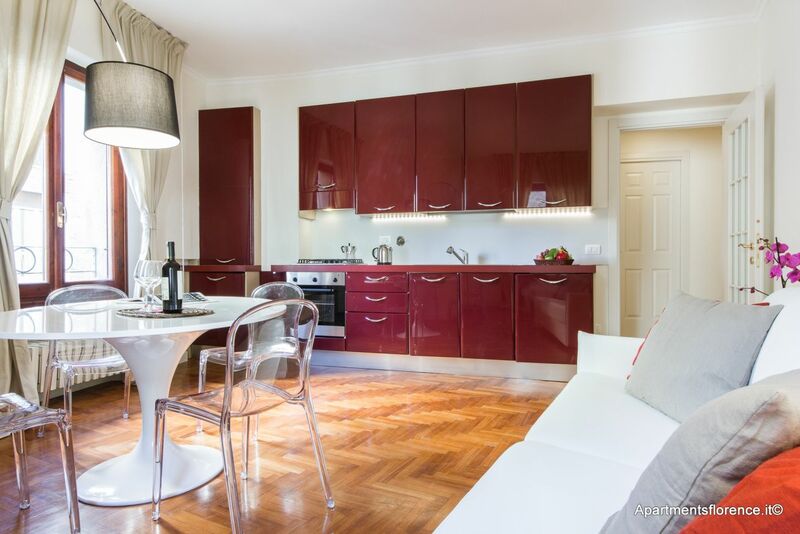 The kitchen is very comfortable to navigate in, with all the necessary kitchen amenities, including a washing machine and a dishwasher. 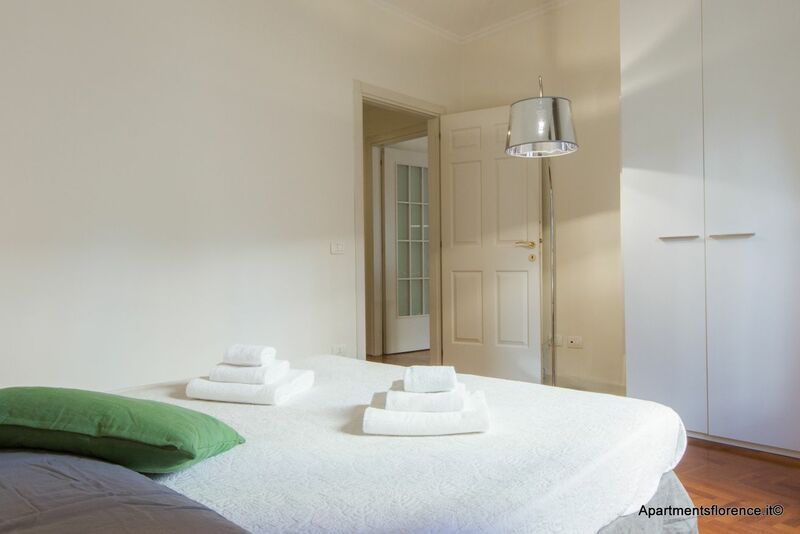 The bedroom is very spacious and decorated in a simple elegant manner. 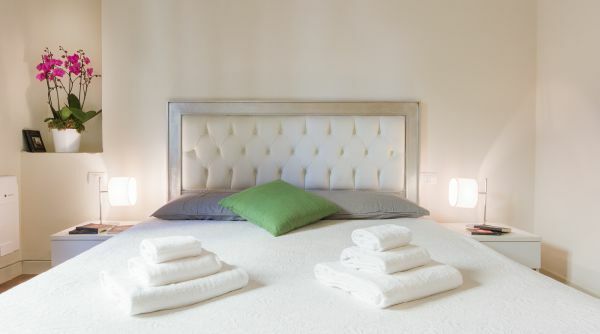 It has one double bed and two large closets that are adequate even for long-term storage. 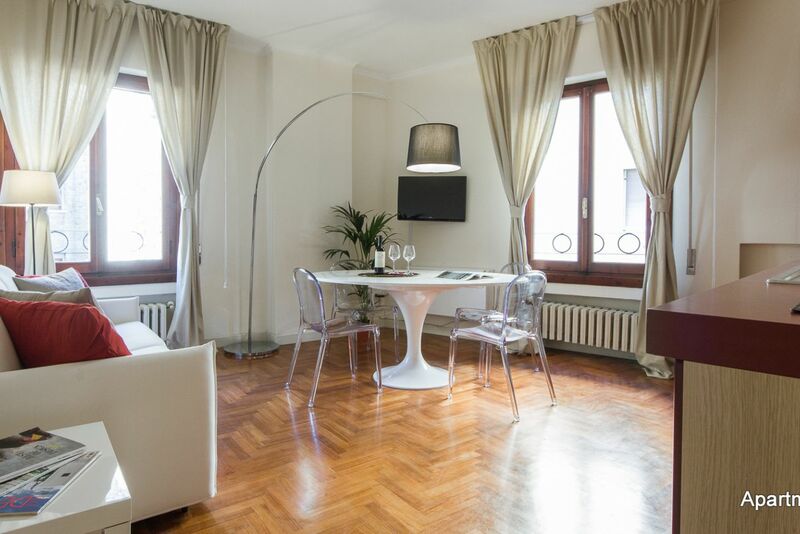 The room is bright because of the window facing the street, which also allows guests to enjoy the view of Palazzo Vecchio. 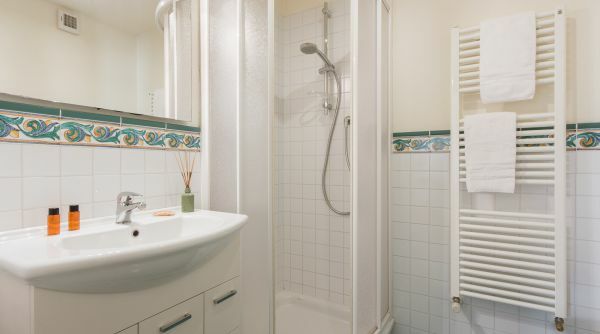 The bathroom is clean and orderly, all in white. 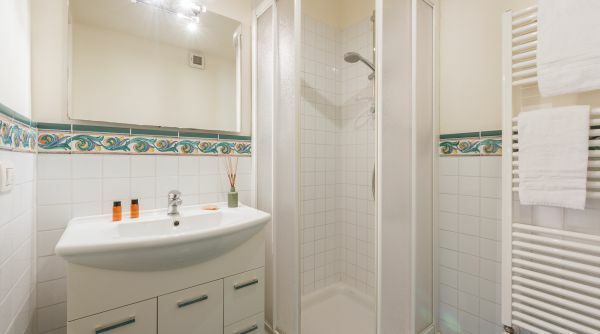 It is very spacious with a large shower. 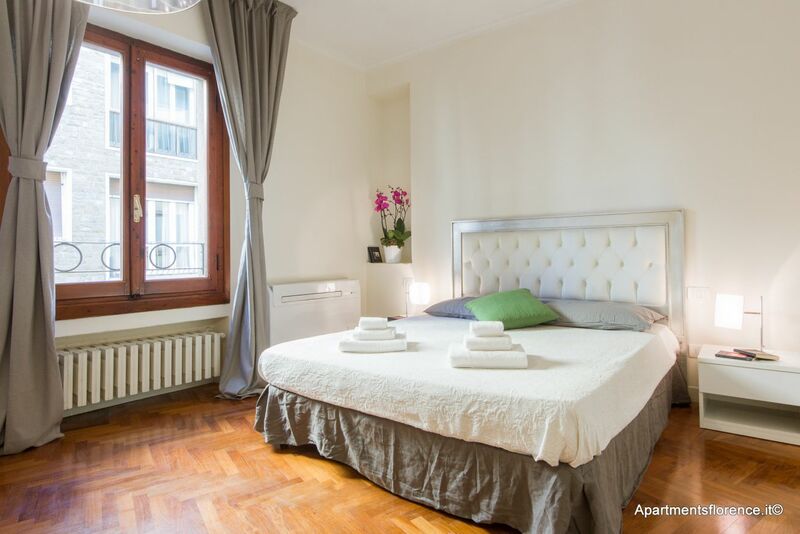 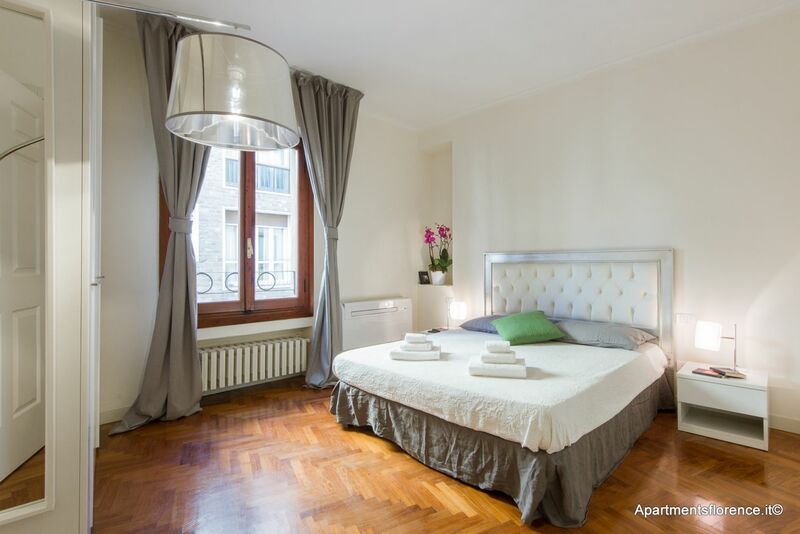 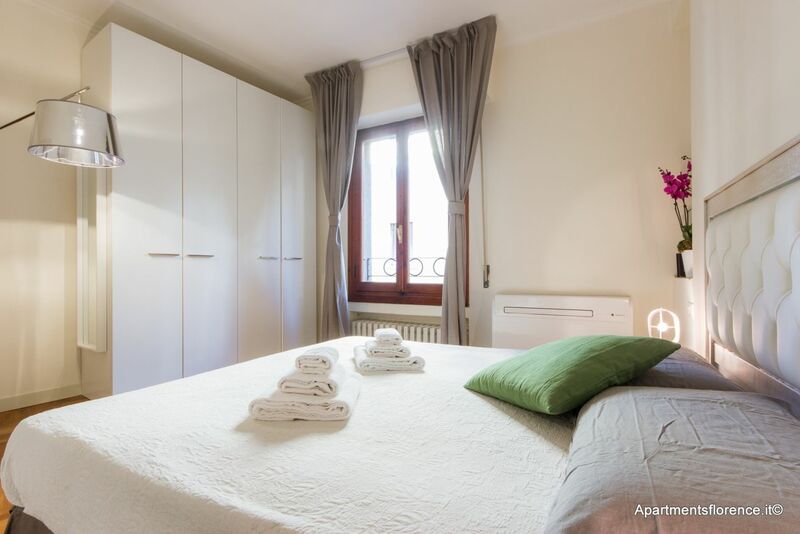 Because of its amazing location in the centre of Florence, and the fact that there are two windows facing a main street with lots of tourist traffic, the apartment owner has installed new sound proof windows and window blinds. 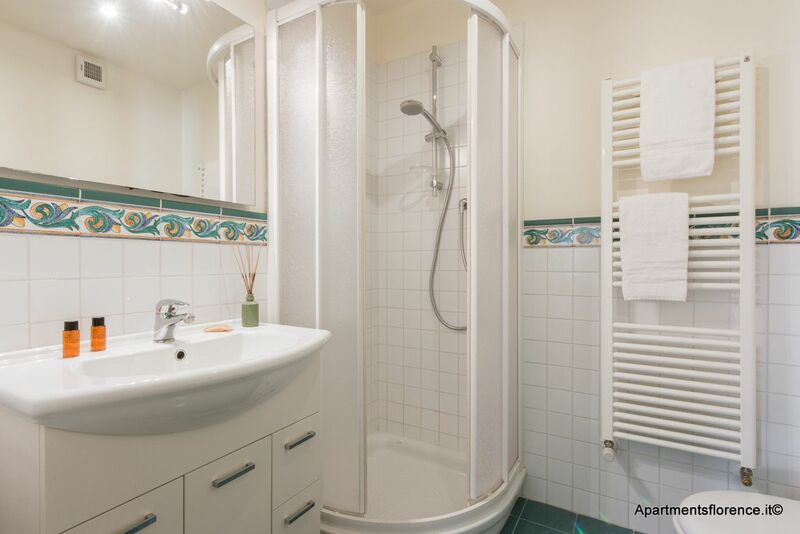 This successfully minimizes the noise level in the apartment. 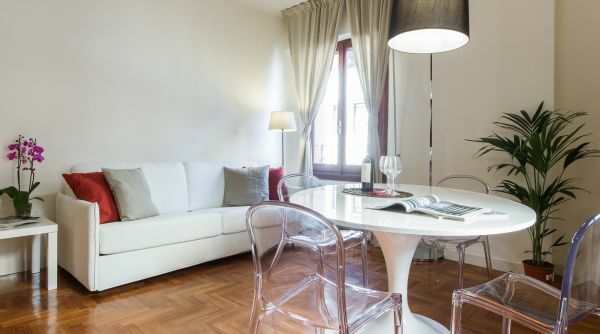 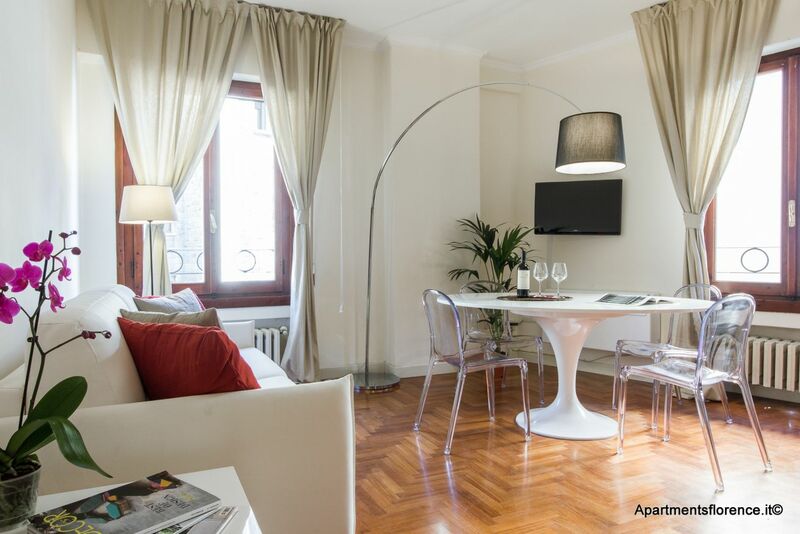 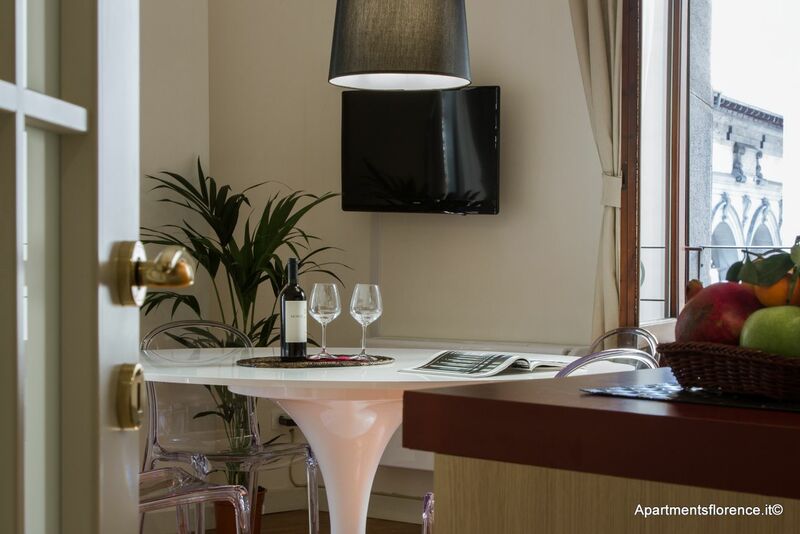 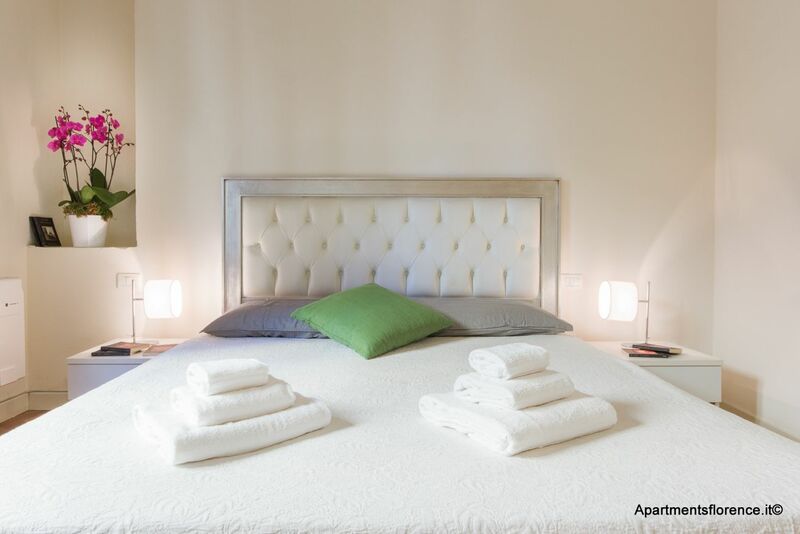 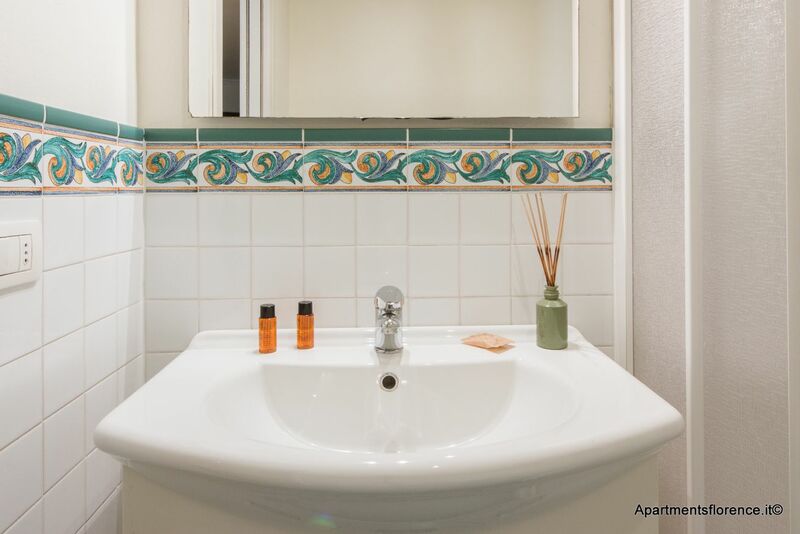 The apartment offers all the comforts of a real modern home in a prime central location – it is an unbeatable choice for a vacation in Florence!